We have mentioned before the old maxim that while cooking is an art, baking is science. We are sorry to have perpetuated a myth. 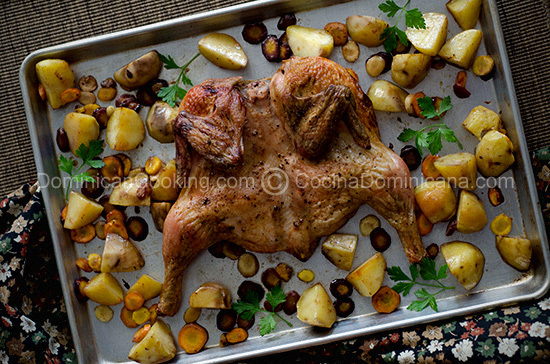 This Brined Chicken Roast proves that is not the case. The fact is, cooking is as much science as baking, and baking is as much an art as cooking. Very few artistic disciplines are rooted in as many scientific disciplines as cooking is. This is what really fascinates me about this whole thing. It’s like playing with a giant chemistry set every day. Some days I even sport the “mad scientist” hair. Cooking is a combination of chemistry, physics, thermodynamics, psychology, botany, zoology, anatomy and probably other sciences I am forgetting now. But cooking is not just the sterile practice of scientists, or the daring pursuit of chefs. Cooking at its worst, and best, happens every day in kitchens everywhere. Home cooks and professionals alike have often fallen for old wives tales that bear no resemblance to scientific reality. I’m a skeptic at heart, so I love it when I see proof that something works (or not). Enter brining, the practice of bathing meat in brine to supposedly make it tenderer and juicier. Brining is not a part of the Dominican cook’s repertoire, and it’s not like we have missed it terribly; after all braising is the preferred method of cooking meats in our home kitchens. And when it comes to roasting we have our own version of brining: we rub and stuff the meat with seasonings that contain both salt and water. While I have done some brining in the past, I admit that I was a bit skeptical of the reasons why brining supposedly works. So, does brining work? Using Holland House lovely red wine vinegar, salt from my hometown of Montecristi and a few other ingredients and herbs of choice, I ended up with the juiciest chicken roast I have made so far. It was plump, tender and bursting with flavor, you will be sure to incorporate this technique in your cooking after you try it. Best Brined Chicken Roast Recipe: The juiciest, most flavorful chicken you would have ever cooked, try it and it will become your family's favorite. Mix water with the ingredients for brining. Butterfly the chicken (cut open through the breast plate and flatten). Place the chicken in a deep pot and cover completely with the brine mix. Place the chicken in the fridge and let it rest for 4 hours. Pre-heat the oven to 350°F [175°C]. Take the chicken out of the brine and discard the brine. Rinse the chicken to eliminate excess salt. Pat dry and brush all over with oil. Sprinkle with pepper. Place the chicken skin side up on a a roast tray with rack. Roast until the thermometer reaches 71 °C [160 °F], start measuring at 1 hour. Roast for an hour, remove from the oven and turn around, the chicken will be ready when the juices run clear, return to the oven until there is no sign of blood. Why not add some potatoes to the pan and make your dinner in just one step. I made this brine chicken which was good but my family didn’t like it as well as my brine I made up. I used lemon juice instead of wine vinegar about 2 Tablespoons honey several cloves of garlic a whole onion tsp dried thyme tsp rosemary. Oil and water are same as above. Hi. is the recipe for 2 chickens or just one? Hi Clara. I made this yesterday and me and my family loved it. I will definitely make this again. Thanks for this simple recipe. I never tried brining and I do agree with you on the chemistry part! Baking is more tricky than cooking. These looks perfect and love the styling! That depends on what you cook. Mean is pretty trick, trickier than any baking I’ve done. I’ve always heard people raving about brining turkeys, I have never tried it, but now I have too. I want to dig into that chicken.